We have been on NBN for almost a year with fibre to the hub. I am with TPG which costs $69.99 per month for up to 50 mbs and $10 for all phone calls. By signing up fo 18 months the modem was free. This is only $10 more than I was paying for ADSL2 which was down to 2 to 4 mbs and a lot less than I was paying for phone rentel and calls through Telstra. I am saving heaps and the slowest speed I have had is 32mbs with the average being 38mbs. I am more than satisfied. There's a recent thread on this. You may find the comments helpful. We have been on NBN for 18 months. Started with Optus, now with Aussie Broadband. It costs us $79 per month for up to 50 mbps. We regularly get 45 and above with fibre to the node. Call centre based in Morwell, Vic and the are extremely helpful with any problems. If you refer anyone you get a month free. No contracts. We supplied our own modem. Forgot to mention that we have unlimited downloads. Plans with the modem included are on a 24 mth contract. We have been on the NBN for some time and the speed we were given was 25mps which is adequate for our needs. We are with Telstra for landline and internet and the cost is $69/pm for unlimited calls for local, national and mobile numbers and 200Gb/pm internet. The modem was free because we were already Telstra customers. Our mobile is with Boost and costs $20/pm for unlimited calls to local, mobile and national numbers with 8Gb of data. We're happy with the service. "was considering a phone line but was told that our number will not port because we have fibre to the curb" - haven't heard this one before - can anyone else throw any light on it - if it's true or not? Cant say Ive ever heard of 'fibre to the curb'. Wont lengthy mobile calls be more expensive? Fibre to the Curb (FTTC) is one of the newest parts of Australia's National Broadband Network. 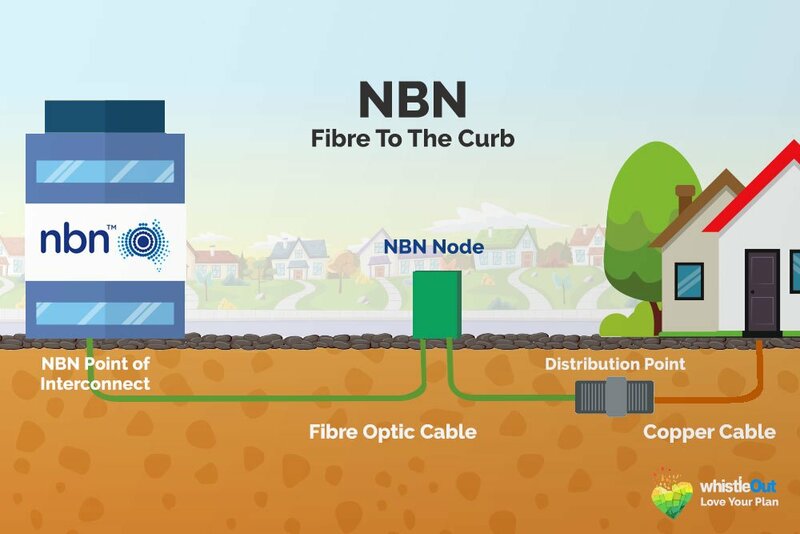 With a Fibre to the Curb (FTTC) connection, an NBN fibre optic cable is laid directly to your property's kerb or driveway, where it connects to the copper phone line that runs into your home. • Your copper phone line connects the distribution point to your house. We've got NBN with Telstra. We were already with them for ADSL2. WE had been with other ISPs but when it came down to troubles we had - they are using Telstra techs anyway at local exchanges and their customers get first in line for technical boots on the ground. We had had problems and Telstra came out and rewired into the house as well as to points so never had a problem or drop out since. Cost is $99 a month for bundle which includes the home phone and all free local calls except 1300 plus cheaper national and international calls. And Play TV 2 years same as contract. Free Big Pond movie to start off and then cheap movies as well as usual on demand. Unlimited data and speed is 53 down and 16 up just now when checked. Didnt pay anything to change over - free router and set up. Free Telstra mobile to mobile calls too. And been on NBN for close to 2 years as contract expires March 19 just checked also. Will likely just renew it as big advantage to my mind is that one fact. techs in the area on mobiles to call immediately a problem - but havent needed too for some years now.